GC Mainly because of what it’s doing. It’s also an extraordinary feat of human engineering, which is a celebration of humanity trying to reduce the negative impact it has on the planet. GB So the beauty is mostly ethical for you? Or do you like the fact that we can harness nature in this way? GC It’s both. It’s the fact that human beings have designed something to generate power so efficiently and effectively. We have that one single 900 kilowatt Enercon E44 turbine and it powers the whole of Glyndebourne. That’s all we need and it’s not even a particularly big one. It’s 66 metres to blade tip. We painted it battleship grey so it blends in with the English sky. I think all turbines should be painted this colour. It’s better than the starkness of the white, which stands out a lot more. GB Did you find that a lot of people were opposed to it? GC God yes! It took six years to get planning permission, mostly because of the fear of despoiling the beautiful South Downs. For me, the main beauty might be what it’s doing but I also think it’s like a piece of art on it’s own and actually enhances the landscape around it. It makes you look at the landscape more than if it wasn’t there. Your eye does go to it but it makes you look and it sends out an incredibly strong message. The local school children were right behind it because they’re the generation that will be most affected by what the current generation is doing. GB So it not only makes people think about the beauty of the landscape, it makes people think about the importance of preserving it every time they see it. GC Yes. It makes you think about how you live and it’s a very strong symbol of our age. GB Are there other wind farms in the area? GC No. We were the first on the South Downs. There are a lot in the West Country and Scotland but very few in the South East because most councils reject them. The planning officer from Lewes District Council recommended refusal on the grounds of “negative visual impact”. He was over-turned six votes to five. It was then called in for a public enquiry by Natural England and we were up against the whole lot from the Council of Natural Parks to the Ramblers Association, the works. 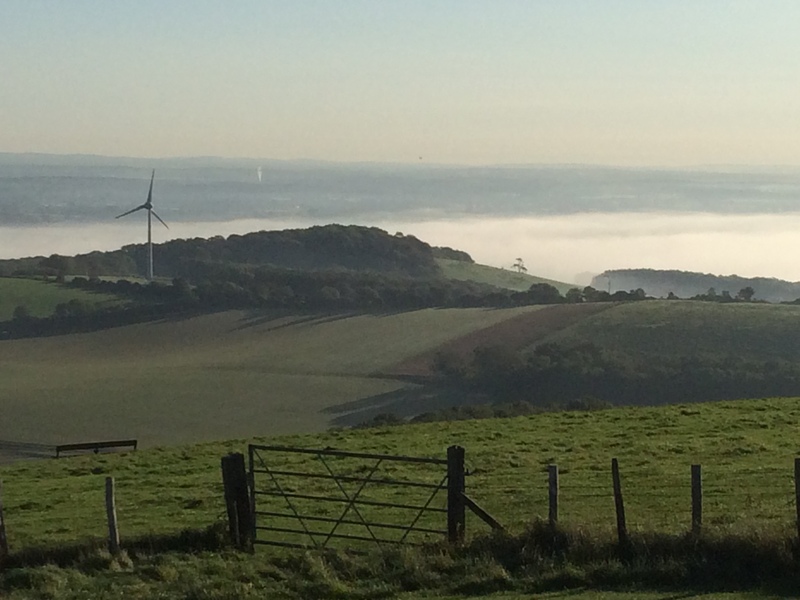 The big fear was that it would open the floodgates but this was over three years ago and not one other turbine has gone up in the South Downs National Park, so they needn’t have worried. I think it’s great that it’s there because people can now come and have a look and judge for themselves. GB You grew up in a very old house, surrounded by nature, so does the novelty of this incredibly slick German engineering appeal to you? GC I studied zoology and made wildlife documentaries around the world for ten years so I got to see a lot of the destruction that man is doing to the planet. It’s got more to do with that. When I came back and took on Glyndebourne, climate change was beginning to feel very imminent so I wanted to do my bit to reduce our carbon emissions. In one fell swoop this reduced our emissions by 50%. The engineering is also staggeringly good. There are 20 tonnes of copper in the nose, or nacelle, which is designed by Norman Foster. He was enlisted to make the Enercon turbines look attractive because of the controversy around wind farms. You just need the tiniest breath of wind to get those blades going. They’re incredibly sensitive. That energy comes straight down to Glyndebourne so we’re running entirely on wind, which is wonderful. And it’s like a piece of sculpture too. GB Do you think that there are different levels of beauty? Do you think nature is the highest form of beauty? GC Yes. A lot of artists imitate nature. I’m a fan of realistic artwork but nothing beats a beautiful morning up on the downs with a low-lying mist. I go biking up the hills three times a week. When I was making wildlife documentaries I spent four years in the Serengeti, which was mind-blowingly beautiful through the seasons. GB You’re quite spoilt for choice when it comes to beauty! You have all the opera too! GC Yes, if you get all the ingredients right in an opera it can stay with you a long time. It can be very powerful. You asked me to choose one thing! That was difficult. Nature is quite raw and being out in landscapes is quite primeval in a way. But opera can appeal to all the senses – visual, aural, intellectual. It can reach down and touch you in a very different way to being in a beautiful landscape. Our theatre is very beautiful too. It’s very inclusive and has this lovely intimacy. There was a lot of care taken in its design. GC If you’re taking the turbine, it’s about what it’s doing as much as what it looks like. You could say the same about an opera. Its beauty is in how it’s touching you and making you feel. A good film or a good play can make you reassess your life. As can the turbine.